This academic section of the Archive brings to light the decades-long history of the Romani civil rights movement, which still remains insufficiently known. It aims to tell the self-narrated history of the Romani civil rights movement across and beyond Europe, emphasizing the role which Romani subjects themselves have played in fighting for the emancipation of Romani communities. 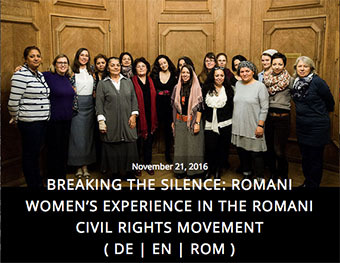 The Romani Civil Rights Movement section will document the Romani civil rights movement, demonstrating the leadership, commitment and vision of Romani actors as protagonists and active agents of change, and contextualize their thoughts and actions. In interviews and essays, the curators introduce important figures and central events of the civil rights movement. The archive section concentrates geographically on Germany, Sweden and Norway, Finland, Romania, Hungary, Poland, Great Britain and Spain; short essays will also cover the history of Roma activism in France, Turkey, Austria, Bulgaria, Italy, Kosovo, the US and Canada, Russia and Latin America, among other. Further topics include the political activism of Romani women, Roma youth activism, migration school desegregation movement, historical justice and the fight against anti-gypsyism; and the history of the international Roma movement.